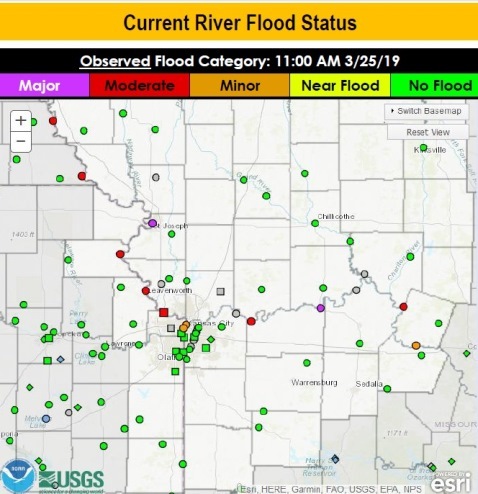 Spring brings 60-degree day, declining flood waters, heavy rain Thursday and fire danger Wednesday – Welcome to Wyandotte Daily! 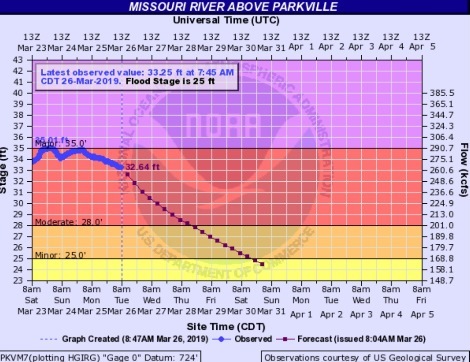 A beautiful spring day is in store for Wyandotte County today, as the weather forecast also details the continuing moderate Missouri River flooding and the heavy rain predicted Thursday and Friday. Today’s high will be about 60 with mostly sunny skies, according to the National Weather Service. 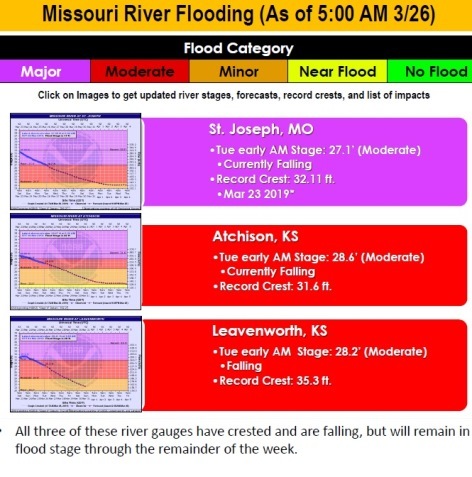 Wyandotte County remains in moderate flood stage along the Missouri River, with the river levels declining a little today, according to the weather service. 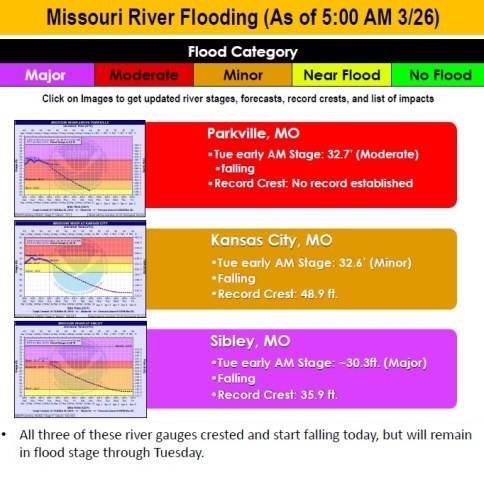 The flood warnings are at the moderate level along the river in Wyandotte County. 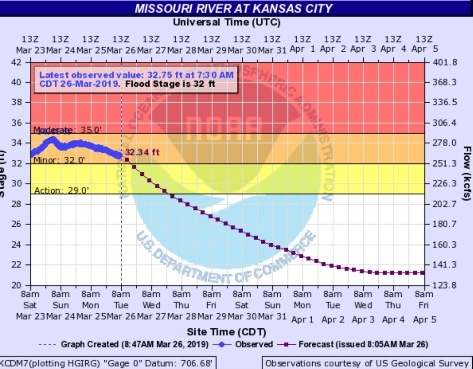 On the east side of Wyandotte County, the Missouri River at Kansas City near the downtown Kansas City, Missouri, airport is in the minor flood stage, and the Kansas River at Kansas Avenue and the state line is in minor flood stage. 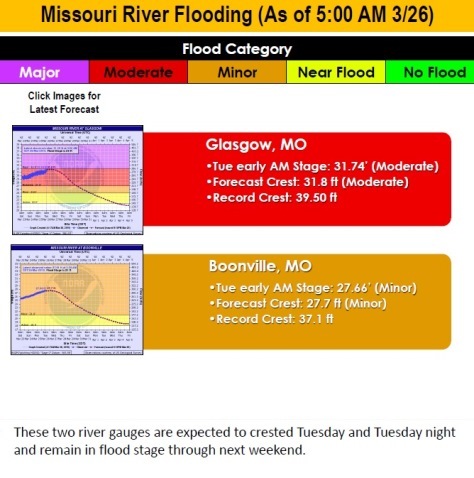 A heavy rain on Thursday and Friday over the region can aggravate the current river flooding, the weather service stated. 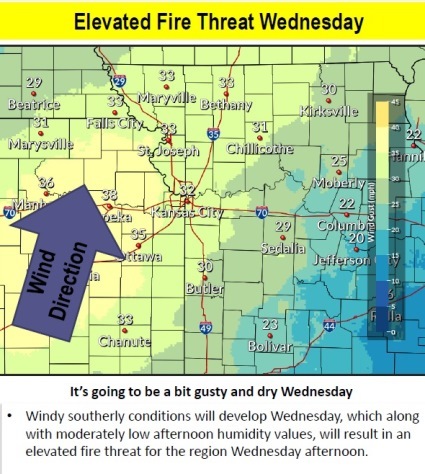 In addition, Wednesday will be windy and dry, with an elevated fire threat in the area, the weather service said. Today, it will be mostly sunny with a high near 60 and a light and variable wind becoming southeast around 5 mph in the afternoon, the weather service said. Tonight, it will be mostly clear, with a low of 45 and a south southeast wind of 6 to 8 mph, according to the weather service. Wednesday, it will be mostly sunny with a high near 70, the weather service said. 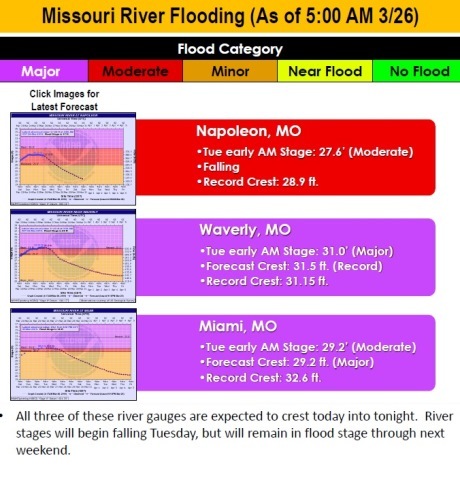 A south wind of 8 to 13 mph will increase to 16 to 21 mph in the afternoon, gusting as high as 36 mph. Wednesday night, there is a 20 percent chance of showers after 1 a.m., with a low of 54, according to the weather service. A south southwest wind of 11 to 16 mph will gust as high as 24 mph. 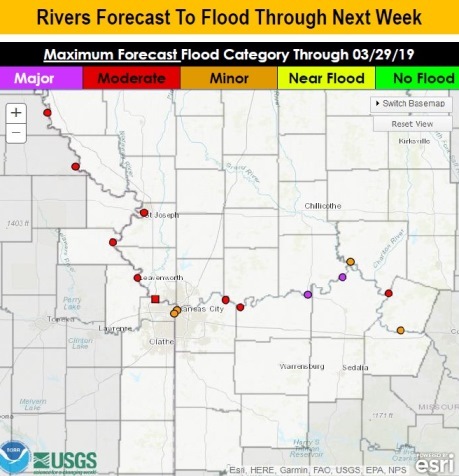 Thursday, there is an 80 percent chance of precipitation, with showers and thunderstorms before 10 a.m., showers between 10 a.m. and 1 p.m., and then showers and possibly a thunderstorm after 1 p.m., the weather service said. The high will be 68 with a south southwest wind of 8 to 10 mph. 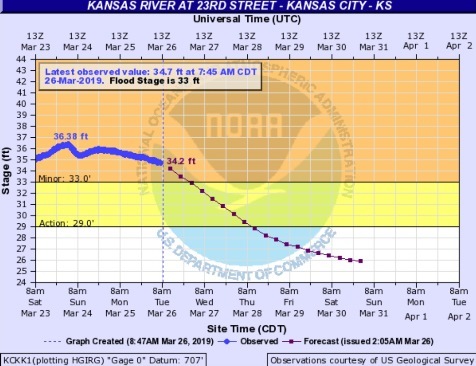 Between a tenth and quarter-inch of rain is possible here. Thursday night, there is a 70 percent chance of showers and possibly a thunderstorm, with a low of 53, according to the weather service. 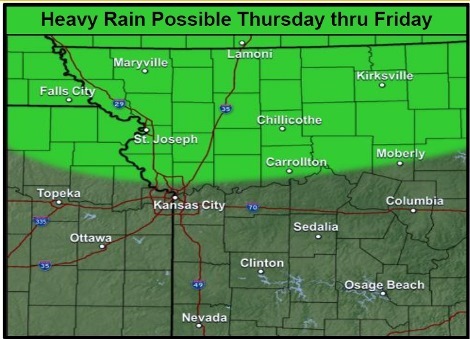 Between a quarter and half-inch of rain is possible. Friday, there is a 90 percent chance of showers, with a high near 64, the weather service said. Friday night, there is a 90 percent chance of showers and possibly a thunderstorm before 1 a.m., according to the weather service. The low will be around 38. Saturday, it will be mostly cloudy with a high near 45, the weather service said. Saturday night, it will be mostly clear, with a low of 26, according to the weather service. Sunday, it will be sunny with a high near 48, the weather service said. Sunday night, it will be mostly clear, with a low of 33, according to the weather service. Monday, it will be mostly sunny, with a high near 55, the weather service said.